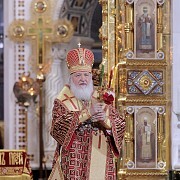 On the morning of Great and Holy Saturday, April 30, the Administrator of the Patriarchal Parishes in the USA, His Grace Bishop John of Naro-Fominsk led the Divine Liturgy of St. Basil the Great with the reading of the 15 Old Testament readings in St Nicholas Cathedral in New York City. On Great Friday evening, the Administrator of the Patriarchal Parishes in the USA, His Grace Bishop John of Naro-Fominsk led the Matins of Great and Holy Saturday in St. Nicholas Cathedral in New York City. 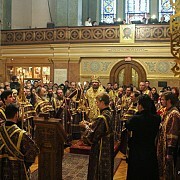 On the afternoon of Great and Holy Friday, the Administrator of the Patriarchal Parishes in the USA, His Grace Bishop John of Naro-Fominsk led the Great Vespers with the bringing-out of the Holy Plashchanitsa of Christ in St. Nicholas Cathedral. On April 28, the evening of Great and Holy Thursday, the Administrator of the Patriarchal Parishes in the USA, His Grace Bishop John of Naro-Fominsk led the reading of the 12 Passion Gospels during the Matins of Great and Holy Friday. 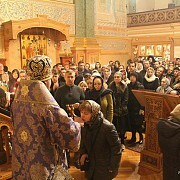 On April 28, Great and Holy Thursday, His Grace Bishop John of John of Naro-Fominsk celebrated the Divine Liturgy of St. Basil the Great in St. Nicholas Cathedral in New York City. On Holy Wednesday, April 27, the Administrator of the Patriarchal Parishes in the USA, His Grace Bishop John of Naro-Fominsk, co-served by cathedral clergy, celebrated this year’s final Divine Liturgy of the Presanctified Gifts in St. Nicholas Cathedral in New York City. On Sunday, April 24, the feast of the Entrance of our Lord into Jerusalem, the Administrator of the Patriarchal Parishes in the USA, His Grace Bishop John of Naro-Fominsk led the Divine Services in St. Nicholas Cathedral in New York City. A delegation comprising of representatives of numerous Russian-American Organizations in the State of New York in support of resolution marking April 2016 as “Russian-American History Month” in New York attended a session of the Senate and State Assembly on April 11. 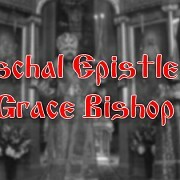 On Sunday April 10, the Fourth Sunday of Great Lent, the commemoration of St. John of the Ladder, the Administrator of the Patriarchal Parishes in the USA, His Grace Bishop John of Naro-Fominsk led the Divine Liturgy in St. Nicholas Cathedral in New York City. 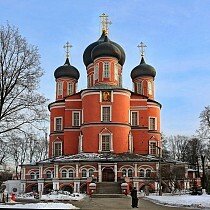 On Monday, April 4, a meeting was held in the Administrative Center of the Orthodox Church in America between the Primate of the OCA, His Beatitude Metropolitan Tikhon of all America and Canada and the Administrator of the Patriarchal Parishes in the USA, His Grace Bishop John of Naro-Fominsk. 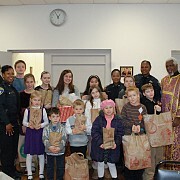 On Wednesday March 30, the Administrator of the Patriarchal Parishes in the USA, His Grace Bishop John of Naro-Fomisnk met with students of Holy Trinity Seminary in Jordanville, NY. 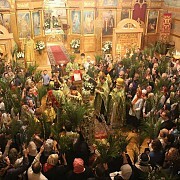 On Sunday April 3, the Third Sunday of Great Lent, the Veneration of the Life-Giving Cross, the Administrator of the Patriarchal Parishes in the USA, His Grace Bishop John of Naro-Fominsk led the Divine Liturgy in St. Nicholas Cathedral in New York City.